Select an item below for more information. The City of St. James has a Park Adoption Program. All that is needed to do is police up the park to make sure there is not garbage or rubbish and other debris, and simply notifying the City if there is something wrong with the park. Opportunities are varied based on people’s abilities. Contact the activity director for more information on volunteer opportunities. 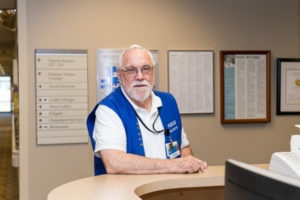 Mayo Clinic Health System has multiple opportunities to volunteer, from visitor information to hospice care. Do you enjoy spending time with senior citizens? This is a wonderful opportunity to either visit or to make a difference. Senior dining is offered Monday through Friday at the Community Building, and you can volunteer to play games with the diners when they are done eating. Meals are also delivered to senior’s homes by meals on wheels volunteers Monday through Friday. Meals on wheels is an hour long commitment from 10:45 to 11:45 and playing games would be around 12:15. Volunteers are always needed to continue this vital community service. Contact Dana for more information. There are multiple volunteer opportunities with Habitat for Humanity. Indoor and outdoor projects are available to volunteer on Monday through Friday. All volunteers are guided by professional staff. Construction experience is not necessary. Visit the website link above for more information. The City of St. James has a unique opportunity for volunteer firefighters. The fire department accepts applications on an on-going basis. For more information call the fire hall or visit their website. Contact Tim at the St. James office to learn about opportunities to volunteer within your community to make a difference. If you are interested in becoming a part of the big buddy program, please contact Rachel listed above. Watonwan County Big Buddy Program needs mentors for children. Big Buddy Program provides monthly activities and/or a mentoring relationship with an adult role model. Activities may include field trips, movies, swimming and much more! Hours of Operation: M W F 10:00 am to Noon. Please contact us directly by phone if you would like to donate or volunteer. If you call after hours, leave a voicemail and your call will be returned. As a smaller humane society in rural southern Minnesota, they are dedicated to the welfare of companion animals. They house animals at their shelter in St James as well as utilizing foster homes. The animals in their care often come to them one of two ways: as a stray from Watonwan County or as an owner surrender. They are primarily run by volunteers, and are always looking for more help! Wellspring provides aide to the elderly and those in difficult circumstances by providing transportation, care giver support, group education, senior exercise, grief support, respite care, housekeeping and social visits. There are multiple volunteer opportunities available.